As one of Australia’s most popular shade cloth fabric brands, Z16 holds an unrivalled reputation for durability, UV-R performance and quality. 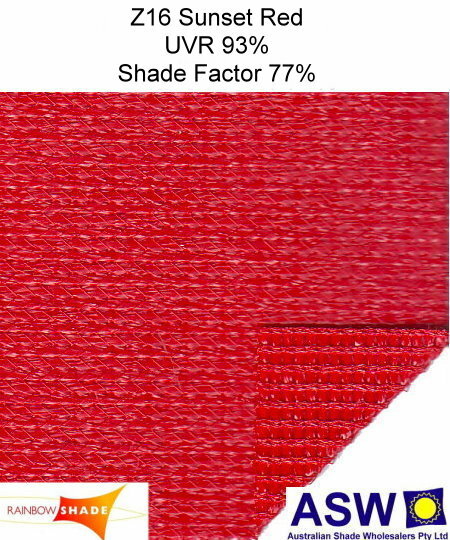 This shade cloth fabric offers the ultimate UV-R and UPF protection (up to 99%). Tests prove Z16 to be the best performing shade sail cloth fabric for UV-R Protection and longevity over 15 years. Available in a wide range of colours, Z16 is suitable for a range of applications including shade sails, shade structures, car parks, pools and schools. Designed to reduce glare, heat and provide comfort and protection, this high quality shade cloth fabric is the perfect choice for your next shade project.